The burning question on the minds of many residents in Southcentral Alaska is, “When will the aftershocks stop?” This is a tricky question, but enough time has passed since the November 30 magnitude 7 earthquake for us to make an informed estimate. We usually say that aftershocks have stopped when the seismicity in the ruptured area returns to its background level, which is the average rate of earthquakes prior to the mainshock. Because people mostly want to know when they will stop feeling aftershocks, we’ll estimate when we expect a return to background level for earthquakes greater than magnitude 3. When we look at plots showing the number of magnitude 3 and larger earthquakes each day, we can see that those daily counts start high and decrease rapidly. This is a defining characteristic of all mainshock-aftershock sequences. Mathematically speaking, the decrease is logarithmic and asymptotic. 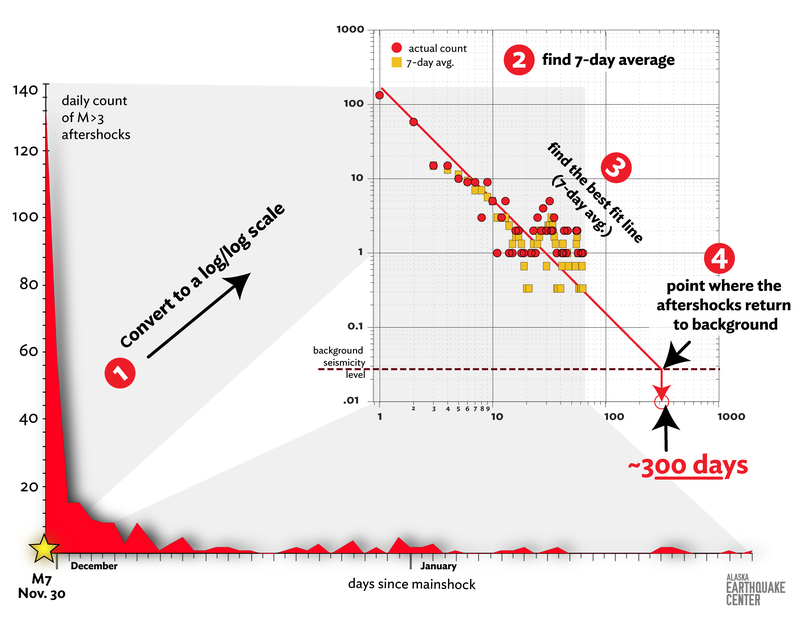 In other words, the declining rate of aftershocks can be graphed as a curve that falls steeply at first and then levels off gradually without ever quite reaching zero. Because of this relationship, we can plot the data on a log/log scale (1). If we also plot seven-day averages of aftershock counts over time (2), we can draw a line representing the rate of decrease in seismicity (3). By finding the point where that line crosses a line representing background seismicity (4), we can estimate when the rate of aftershocks will drop below pre-mainshock levels—in other words, when the aftershock sequence will effectively be over. As time passes and we collect more data, we can refine this analysis. Our current estimate suggests that aftershocks of magnitude 3 or larger will continue for around 300 days after the November 30 mainshock. In other words, people in Southcentral should expect to keep feeling aftershocks through September, at least. Around that time, based on what we’ve seen so far, the aftershocks should blend into the activity we know and expect in that area. Remember, this only applies to the relatively small part of Southcentral Alaska that ruptured during the November 30 earthquake, from south of Point MacKenzie north to around Big Lake. Earthquakes outside this small area are not aftershocks from the magnitude 7 earthquake—they’re just part of the background seismicity in other areas that haven’t ruptured recently, and should remind us that large earthquakes are possible anywhere and anytime in Southern Alaska. When we look at the number of larger earthquakes per day (M3+) on a log/log scale (1) and calculate the seven-day averages with time (2), we can fit a line that defines the rate that aftershocks are decreasing (3). The point where that line intersects the background seismicity typical of the area (4) marks the estimated amount of time we expect aftershocks to continue. Click on the image to enlarge.